Muztar Khairabadi (full name Syed Iftikhar Hussain Rizvi) was born in 1865 in Khairabad, District Sitapur, U.P. He was the maternal grandson of ‘Allama Maulvi Fazl-e-Haq Khairabadi’, a poet, philosopher, and religious scholar, literary person of Arabic, Persian, and Urdu. He was a freedom fighter and played an important role in the first Independence Movement of India of 1857. His paternal grandfather ‘Tafazzul Hussain’ was Ambassador of the State of Tonk, and in Delhi he had good relationship with Mirza Ghalib. He introduced Ghalib to ‘Nawab Wazir-ud Daula’ of Tonk state. Muztar Khairabadi's father was ‘Haafiz Ahmad Hasan Ruswa’. Muztar’s elder brother ‘Sayyed Mohammad Husain Bismil’ was ustad of ‘Nawab Ibrahim Ali Khan’ of Tonk. Muztar’s mother “Sayyed-un-Nisa Hirmaan Khairabadi” was the daughter of ‘Allama Fazle Haq Khairabadi’ and the sister of ‘Maulvi Shamsul Haq Khairabadi’ as well as ‘Maulvi Abdul Haq Khairabadi’. She was an enlightened poetess herself.. She was very talented woman with many great qualities. Her brother ‘Maulana Abdul Haq Khairabadi’ said of her: "I am glad that she was a woman and not a man. If she were my brother, then I would not have had a chance to shine intellectually in front of her. She is such a great mind." It is notable that ‘Hirmaan Khairabadi’ was an outstanding scholar and poetess in an era when female education was not very common. Muztar grew up under the patronage of his mother, and got initial Islah (correction) in poetry from her. Muztar Khairabadi's descendants who continue his Urdu poetic tradition include his sons ‘Eitbar Husain Bartar Khairabadi’, ‘Yadgar Husain Nashtar Khairabadi’, ‘Jan Nisar Husain Akhtar’ (Jan Nisar Akhtar), and his grandsons ‘Barqarar Husain’, ‘Naamdar Husain’, ‘Shaandar Husain’, ‘Dr.Shahzad Rizvi’, ‘Irshad Rizvi’, and ‘Zia Khairabadi’, and grandaughters ‘Syeda Naheed Nashtar’, ‘Dr. Syeda Suhela Nashtar’, ‘Dr. Syeda Imrana Nashtar’, ‘Rukhsana Waseem’, ‘Javed Akhtar’, and ‘Dr. Salman Akhtar’. Next to this generation family members include, ‘Farhan Akhtar’, ‘Zoya Akhtar’, ‘Kabir Akhtar’, and ‘Nishat Akhtar’. Muztar Khairabadfi served as a judge in the states of Tonk and Gwalior. He was a man of versatile genius. He is famous for issuing his judicial verdict in extemporaneous verse (‘Fil-Badih’). He is also famous for the judgment in the case of Nuthmul, whom he set free in spite of the Maharaja of Gwalior's instructions to the contrary. The Maharaja had Nathumul framed in a case which came before Muztar Sahib. Muztar found Nathumul not guilty as charged and set him free. Thereafter, having defied his royal patron, he left his judicial service in Gwalior and fled to Bhopal. In his final years, he lived and worked in Indore. Muztar had a sharp and creative mind and a remarkable memory. In a room full of his disciples he would ask them to recite their poems, keep track of who had read what, and make corrections. He was a wealthy, handsome man and always wore elegant clothes. His wealth derived from his service as a legal adviser to Nawabs and Maharajas. He was also a teacher and mentor of the ‘Nawab of Rampur’. Muztar Khairabadi died in 1927 at Gwalior and is buried there. Muztar Khairabadi was well-known for his ‘Naatia Kalaam’. He wrote a poetry collection, ‘Nazr-e-Khuda’, in praise of God. His ‘Neyaz-e-Mustafa’ is collection of Naat’s praising the Prophet Mohammad (SAW). His collection "Meelaad-e-Mustafa" also in praise of the Prophet was published by Alvi Press, Bhopal. Muztar Khairabadi's poem ‘Behr-e-Taweel’ and his Nazm ‘Marg-e-Ghalat Ki Fariyad’ are considered to be remarkable in Urdu poetry. His prose is also forceful. “Allah Bas Baaqi Hawas”, “Dukhi Ki Pukar”, and “Munh Dekhi Muhabbat” are good examples of his prose. A collection of his poetry, ‘Ilhamaat’, was edited by his son, ‘Nashtar Khairabadi’. Muztar Khairabadi published a magazine entitled ‘Karishama-e-Dilbar’ in Khairabad, Sitapur. 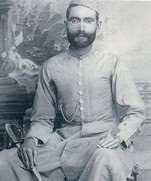 Muztar Khairabadi spent his life in Khairabad, Tonk, Gwalior, Indore, Bhopal and Rampur. In his lifetime he received numerous distinguishing titles, including ‘Khan Bahadur’, ‘Eitbar-ul-Mulk’, and ‘Iftikhar-ush-Shuara’. One of Muztar Khairabadi's most famous poems, “Na Kisi Ki Aankh Ka Noor Hoon” is often incorrectly attributed to ‘Bahadur Shah Zafar’, because of the deep sorrow and dejection expressed in it. Muztar Khairabadi’s collection of poetry is not yet published. What remains of his work are only certain poems that are in the possession of his descendants and admirers. His son ‘Jaan Nisar Akhtar’ had edited his anthology as “Khirman”. His grandson ‘Javed Akhtar’ is planning to get it published soon. Thanks for providing link to family tree of Muztar Khairabadi. I would like to suggest a minor improvement in the family tree prepared by you.